Among other good things in which riders who belong to the C.T.C participate may be mentioned the excellent series of road books published by the club, and the danger-boards established in combination with the N.C.U at the top of steep declines on the main roads. Although some of these boards may be superfluous, they are of great service, and many a rider has to thank their timely warning for saving him from a bad spill, with perhaps fatal consequences. I well remember a most inviting descent, when after some miles of uphill work, I put up my feet for a nice coast. Luckily for me, at that moment the conspicuous warning caught my eye, and, having no brake on my machine, I resumed the pedals, and got the bicycle under control. Not one minute too soon, for as I rounded the next turn the ground seemed to fall away beneath my feet and the tops of tall trees growing only a little further down the road were on a level with my head. Concluding that such a place was not even fit enough to negotiate slowly, I hastily dismounted, and with difficulty walked my machine down among gullies and ruts worn by the rains. The apparently gentle descent was almost a precipice, with zigzag turns in it, none of which could have been by any possibility steered by a runaway rider. In such moments as these the rider realizes what he owes to the men who by their foresight and energy have saved him from a bad accident. We may complain these days about the ‘nanny state’ in Great Britain cosseting us to prevent every potential accident, often taken to a ridiculous level, such as trying to ban the traditional autumnal adolescent game of conkers, lest one of the spiky aforementioned horse chestnuts fall on a boy’s head. I first noticed the contrast between our country’s safe haven, with its warnings of danger, when I went trekking in Nepal. The narrow mountain roads had no vehicles, only donkeys or local porters to carry goods. You did well to remember when you heard an approaching donkey’s bell – not unlike the sound of the bells attached to early bicycles – to pass it on the inside to avoid being knocked over the precipice. There were no danger boards, only occasional remarks from locals: I remember in one spot being told to be careful ahead because a young woman from England had slipped off the path the week before and had died. Cyclists of the 1890s were pioneers riding virgin roads, often without brakes. Every edition of the cycling press reported riders around the country being injured (sometimes killed) coasting down hills: they were a great danger to other road users. The increasing popularity of cycling meant even more new riders, so it became a priority for the recently-established cycling organizations to erect signs – known as danger boards – to warn cyclists of perils ahead. A surge in the manufacture of motorized vehicles resulted in a dramatic increase in traffic accidents. A public meeting at Caxton Hall, London, was held in 1916 to elect a ‘Safety First’ Council to educate the public. This led to the formation of the Royal Society for the Prevention of Accidents. 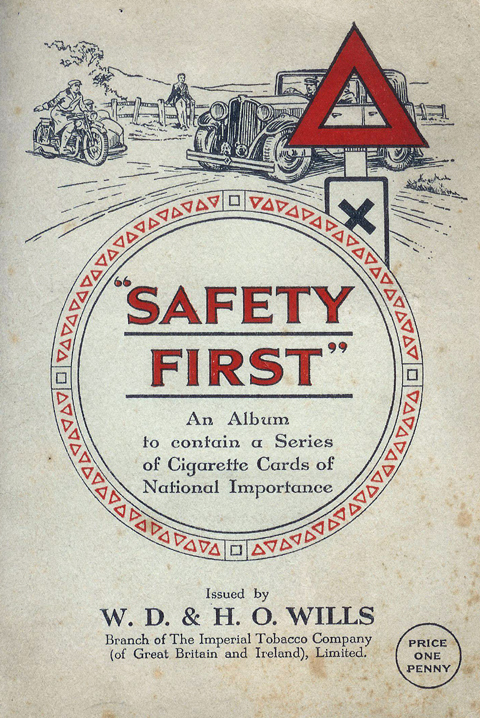 A National ‘Safety First’ Association was formed in 1923, taking a small stand at the 1926 Motor Show. The Duke of York became its patron. By the time he ascended the throne as King George VI in 1936 the public had developed a much greater awareness of accident prevention. By the following year, the 21st anniversary of the Safety First Council, government statistics confrimed that road accidents had declined. 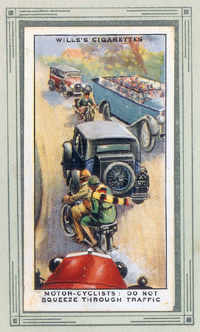 Wills cigarette cards were published as part of its campaign in 1934.